"I live by the Law of Intention. I don't do anything without an intention." It's still surreal that I went on a girlfriends getaway cruise with Oprah in the Bahamas earlier this month! As I said in my last post, I'm trying to figure out how to hold onto the "buzz" I got from the incredible trip. One way is talking and writing about it and integrating what I learned! My friends seem eager to hear about it - especially the part about how we met Oprah - and I'm always happy to indulge them! So I want to start with a little backstory. Before we went on the cruise, we were told by a friend who works for Holland America not to expect to meet Oprah and definitely don't plan on getting our picture taken with her. My friend Kim and I responded in unison with our intention: "WE WILL MEET OPRAH!" There was no doubt in our minds that we would meet Oprah on the cruise. We didn't know how or when, but we KNEW we would. Little did we know, we would "bump into her" within two hours of the boat departing from Fort Lauderdale. After attending the Sail O-Way party hosted on the lido deck by Oprah's BFF Gayle Kyle (who was omnipresent on the trip) and editors of O magazine (you can't make this stuff up! ), Kim and I decided to explore the grand ship. We were checking out the artwork and trying to get our bearings when I spotted a guy standing next to a very large door next to the elevators. He was non-descript and I really didn't have any reason to think Oprah was going to emerge from that door, but I had a sense. So I stopped Kim, we waited and sure enough the huge door opened and Oprah emerged and walked straight towards us. There were only a handful of people around and she quickly invited us to get our picture taken with her. We were screaming with excitement, "We love you!" She exclaimed "I can't believe YOU'RE here!" Wait, we couldn't believe SHE was there!! We took a few selfies with her and watched as more people realized what was going on. She was completely lovely, and then she graciously exited through that huge door just as she had appeared moments earlier. It was surreal! We manifested Oprah!! That was just the beginning...! The next morning when we woke up we were in the Bahamas! Amazing. We took a tender boat to a private island owned by Holland America called Half Moon Cay. When we arrived, there was yoga going on on the beach, which was a beautiful site to see! We took part in a motivational movement session with fitness evangelist Angela Davis that inspired us to live our best lives, to set intentions and find our purpose. Next we explored the tiny island and soaked up the sun! We stayed as long as we could before taking the last tender boat back to the ship to rest up for our big night! Little did we know what was in store for us! I'll try to summarize "dinner with Oprah." Yep, we did it again! Oprah and her entourage of family, friends, staff and, of course her BFF Gayle, dined just feet away from us in a tiny intimate restaurant! Lovely, lovely Oprah visited each table and showed us some more love! It was surreal! Note: I'm sitting down and Oprah's standing up. She's not a giant! Kim invited Oprah to look her up when she's in Seattle. Oprah's holding Kim's business card. You never know - we might be hanging out with Oprah next time she visits the Emerald City! You can see Oprah at the table behind me. Can't wipe the grin off my face! "Intention always determines the outcome." So as I go about my daily life, I want to get better at setting my intention for everything I do. Because, as you can see, it's powerful! I am reviving a special project I launched five years ago when my friend Scott died. 10 Things I Love About You is a simple, yet profound, idea (that I was hoping would become a movement) to let your family and friends know 10 things you love about them (before it's too late). I think it's more relevant now than ever. And it's the PERFECT, FREE Valentine's gift! Start this week for Valentine’s Day by writing down the 10 things you love about your spouse, boyfriend/girlfriend, best friend, son/daughter, mother/father, grandparent, or a cherished cousin and sharing it with them. Flowers, chocolates and jewelry are awesome. Words from your heart are priceless and will be cherished forever. It also makes a great birthday, holiday or "just because" gift. P.S. In invite you to like the 10 Things I Love About You Facebook page to get this movement off the ground! 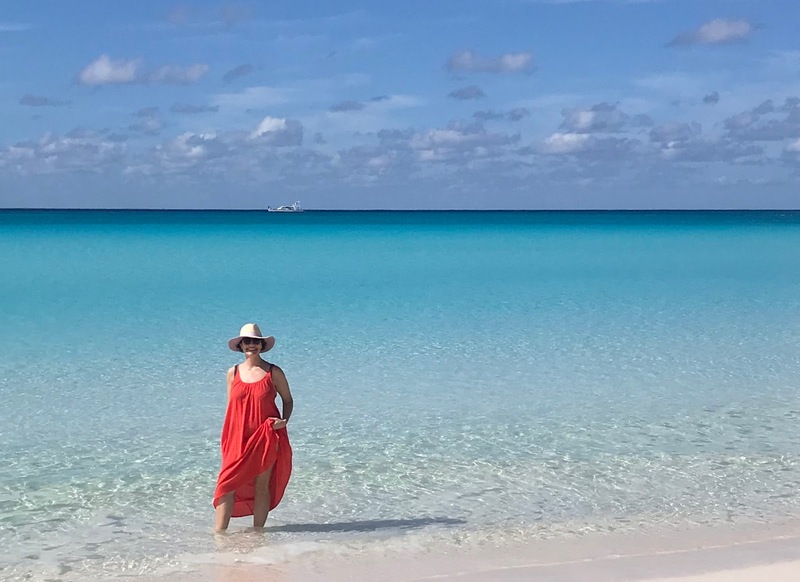 I’m just back from an amazing, life-changing, life-affirming "girlfriends get-away" cruise with Oprah in the Bahamas!! It was beyond O-mazing in every way! I feel like I'm vibrating on a different level after being around Oprah (and 2,500 inspiring women!). I'm just oozing with joy and gratitude! I'm trying to figure out how to hold onto this higher vibration! I think Oprah would say: be present, meditate daily, and set your intention for everything in your life. I wish I could bottle up her wisdom and positive energy. She is truly an extraordinary human being. This is one of my favorite quotes from Oprah's speech at the dedication ceremony for Holland America's Nieuw Statendam ship on Saturday. in most of my life experiences. is the greatest gift you can give." When we encountered Oprah a couple of times on the ship (more on that in another post! ), she was totally present, warm, funny and engaging. What a gift indeed! It's something I will carry with me forever! On the last day of the cruise, we had the opportunity to see Oprah give a live talk, dubbed "A Conversation With Oprah," much like she used to do with her studio audiences on the Oprah Winfrey show, but more interactive. 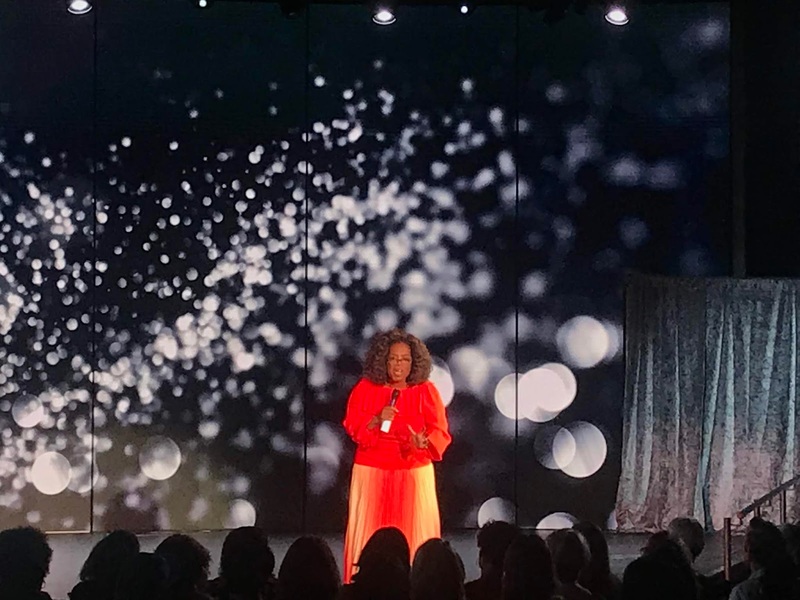 Here I share some of the highlights and key take-aways in hopes that we can all "live our best life" - as Oprah likes to say! She declared each statement with such conviction and passion! She's like a preacher, teacher, mother and girlfriend - all in one! When someone is suffering, always ask: What happened to you? This will give you insights into their behavior and their suffering. You are the master of your fate and the captain of your life. You are always in control. Make yourself whole and complete and overflowing - honor the spirit of life force - God, universe, whatever you call it. You must have a spiritual practice - give yourself the time and distance from voices of the world. Still yourself and give back to yourself fruits of the spirit that allow you to blossom. Be obedient to your call! You only have power in your own territory - stay in your own territory! What you put out (energy) is coming back all the time! BAM! You are responsible for the energy you bring and it always comes back. It’s always right on time. We are always co-creating our life. Everybody wants the same thing: to matter, to be heard. I live by the Law of Intention - I don’t do anything without an intention. I don’t do anything for money. Intention always determines the outcome. I want to offer you my best self. Live an open-hearted life in surprise and delight! Maya Angelou to Oprah - you have no idea what your legacy will be. 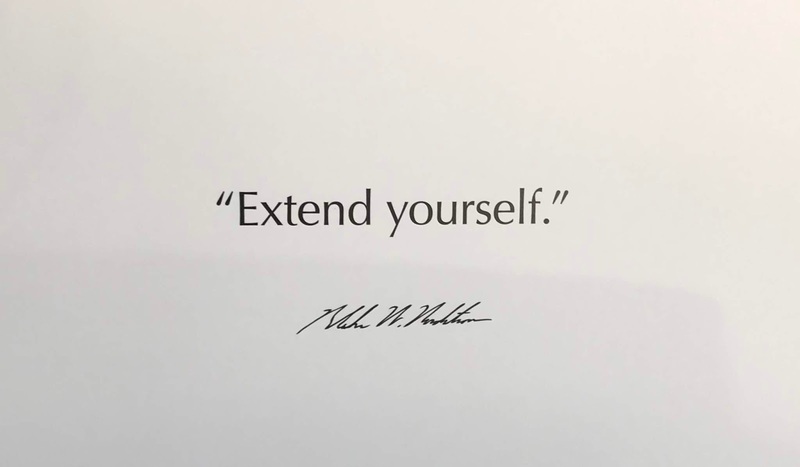 Your legacy is everyone you touch. The work you put out into the world is your legacy. Allow what you want in. What is your truest, highest expression as a human being? Most important question to answer for yourself: What do you really want? Your job is to figure out your pattern. When you’ve outgrown something, it’s time to move on. Keep your eye on the prize. What’s the prize for you? It’s always about an energy exchange. Don’t push against things. Listen to whispers, or messages get louder and become a full blown disaster. Take what you have and use it for good. 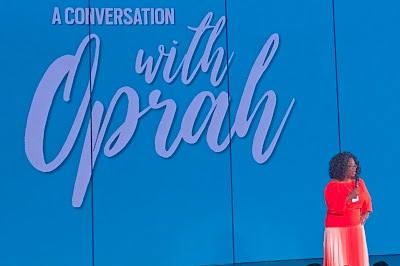 Oprah spoke for about an hour and then Gayle joined her onstage for an interactive Q&A. They have been best friends for 43 years. Truly amazing! My friend Kim and me beaming after Oprah's talk! I want to savor this O-mazing feeling forever! Stay tuned for more details about this incredible experience! The world lost a truly extraordinary human being on January 2, 2019. The sudden and unexpected passing of Blake Nordstrom after a very short battle with cancer has stunned our community and me personally. Blake was my client for the past 4 years. 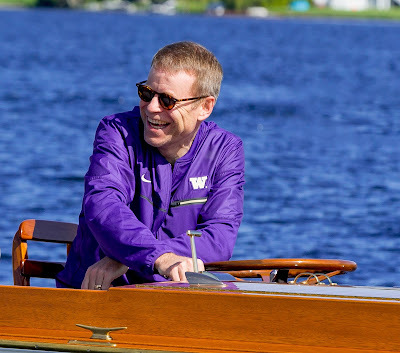 He hired me to help tell the story of his beloved University of Washington Rowing program. He pushed me to be a better person and a better professional. It feels like I lost a friend, client, mentor, and father figure all in one. Blake touched so many people's lives and I feel grateful for the opportunity to work with such a truly amazing leader. As we navigate "life after Blake," I keep thinking What Would Blake Do? So I have a new mantra "WWBD?" Blake would be kind always and treat everyone with respect and dignity. Blake would expect the highest from himself and others. Blake would make time for his community. Blake would show appreciation for big and small things alike. Blake would be generous with his time and resources. Blake would have a wide circle of friends from all walks of life. Blake would pursue his passions (cool cars and old boats!). Blake would dress impeccably with his shoes always shined! Above all else, Blake would love and honor his family. One of the traditions of Washington Rowing is to honor a deceased teammate with a seven-man row. You can watch this poignant and touching tribute here. While I am filled with deep sadness, I am also filled with deep gratitude for knowing such an extraordinary man. RIP Blake W. Nordstrom. We miss you so much. Happy New Year friends! I am feeling very optimistic about 2019. 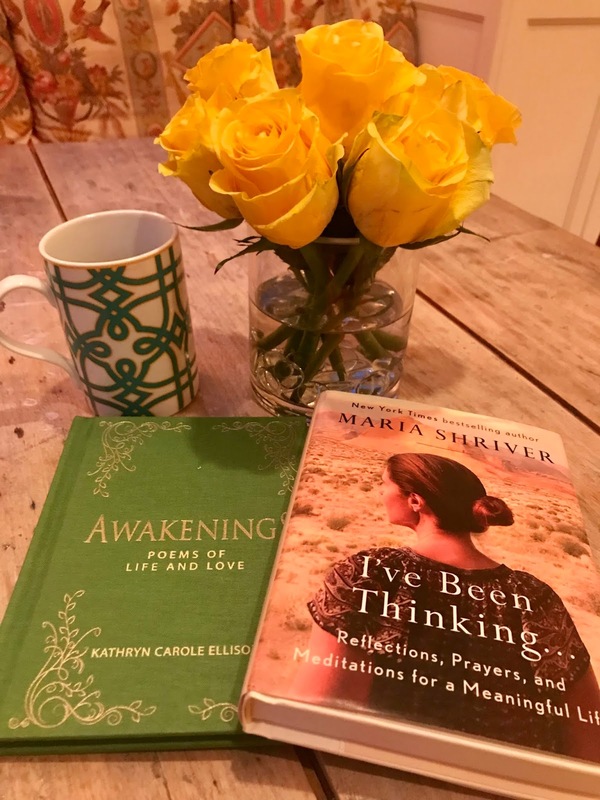 I start every day with inspiration from two amazing, wise women who have lived a lot longer than me and who have beautiful lessons to share for living a meaningful life. My morning ritual of "poem before phone" includes randomly opening to a page in one of Kathryn Carole Ellison's books of poems of life and love (including Awakenings pictured above). Whether a message of "giving and receiving," "your life story," or "you are wonderful," the poem I select - or rather which is selected for me - is ALWAYS the exact message I need that day. Then I read one of Maria Shriver's reflections, prayers and meditations from her book "I've Been Thinking." Both books offer quick doses of inspiration and wisdom that help me start my day. I read a lot of great books in 2018, which I'd like to share with you. Some of my friends tell me they don't know how I have so much time to read. (Hint: I make it!) Books are food for my soul, my entertainment, my inspiration, my escape, my hobby. They say you can tell a lot about people by the company they keep. I think you can also tell a lot about what's important to people by the books they love too. I'm not sure what these favorites say about me, but it was a good, enriching year. I hope you enjoy my selections. Read on! Here's what I'm reading or plan to read in the coming year. Please let me know if you have any "must reads" to add to my list! Especially if you have some good "beach reads"! And for those of you who "don't read" or prefer audio, I recommend the following podcasts. I love to listen to them on my walks! And, finally, I heard a rumor that Maria Shriver is launching her own podcast in 2019. I can't wait! Wishing you a beautiful happy new year!